What could be easier than making your own mustard? No, really. It is stupid easy. 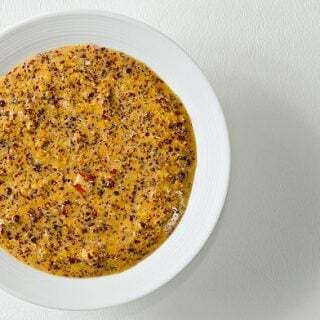 Grind some mustard seeds, mix with mustard powder and some liquid and you’re done. Endless variations exist. Remember yellow mustard seeds are the mildest, black the hottest. Grind the whole mustard seeds for a few seconds in a spice or coffee grinder, or by hand with a mortar and pestle. You want them mostly whole because you are using mustard powder, too. Pour the semi-ground seeds into a bowl and add the salt and mustard powder. If using, add one of the optional ingredients, too. Pour in the water or beer, then stir well. When everything is incorporated, let this sit for up to 10 minutes. The longer you let it sit, the mellower the mustard will be. When you’re ready, pour in the vinegar. Pour into a glass jar and store in the fridge. It will be runny at first. Don’t worry, it will thicken up overnight. Wait at least 12 hours before using. Mustard made this way will last a year in the fridge. Change the liquid and you change the mustard. Grind the mustard seeds a lot or a little and you change the texture — or skip the whole seeds altogether and use just mustard powder. Or skip the powder and just use seeds. Want herbs in there? Go for it. Like honey mustard? Pour some honey in. Want your mustard even spicier? Add chiles or freshly grated horseradish. The most important thing to making mustard at home is to wait. You cannot eat it the day you make it. Mustard needs to marinate to dissipate its bitterness. Try it: Eat a little dab right after you make it, then a day or two later. The difference is dramatic.